2. Please don't step on the hard floor directly(such as cement floor), otherwise the spikes will be easily broke off and affect the aerator shoes's use. PROMOTES LAWN GREENER：The professional grade aeration lawn aerator shoes make it extremely easy to achieve the necessary aeration of soil yourselves for a way greener, healthier and more beautiful lawn. It's not a rocket science - simply wear our lawn aerator shoes and walk around to cover the entire length of your garden. Even better is wear them while mowing your lawn so that you accomplish two important tasks simultaneously. 3 DURABLE STRAPS W/ METAL BUCKLES - Our lawn spike aerator are made up of a sturdy plastic base which provides a good heel support, 13 heavy duty metal 30 mm spikes on each sandal, and 3 adjustable straps with strong metallic buckles. All the metallic parts are designed to be highly anti-corrosive and durable. The ergonomic design ensures that the shoes stay firmly on your feet and the sharp nails make it easy to dig the soil for effective aeration. ENJOY the DIY with FUNs: This lawn tractor aerator also come with a FREE small wrench to make the installation extremely easy. Once installed the lawn aeration shoes can be strapped over any of your strong shoes, making you ready even for the most difficult to reach areas of your lawn. Once you get accustomed to walking in these shoes, you can wear them simply while taking an evening walk in the lawn and achieve effective aeration without any extra efforts, enjoy it! BEST SOLUTION for GARDEN HEALTHIER LAWNS- Lawn aeration shoes are cheaper than an aerator machine rental, and easier than using a hand lawn aerator! The lawn aerator shoes offer a superior alternative over the professional services which might cost you fortunes to maintain a good lawn. 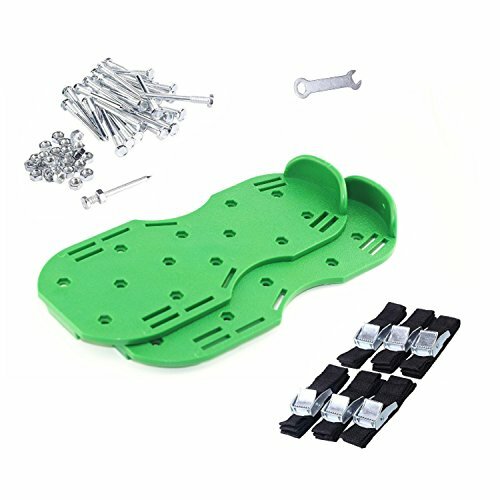 UPGRATED STURDY SHOES BASE - The base is made of polypropylene and HDPE, which is more durable, solid and can last longer; Equipped with 26 nails. If you have any questions about this product by Luxxi, contact us by completing and submitting the form below. If you are looking for a specif part number, please include it with your message.